Wow, absolutely brilliant. Good job. Thanks for your very lovely comment, Sharyn. Wow! So powerful! Wonderful movement and values. How do you do it? So unique. Love the imagination and the awesome execution. Beautiful shades of colors! A Masterpiece! Thank you very much, Carolyn. 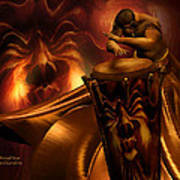 Love the sheen in this painting and the drum beat!! great work! I love this Carol! You can feel the beat. 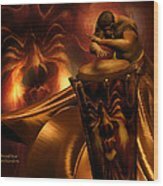 I am a big fan of African drummers and I get to hear them fairly often. I even got play once, The rhythm can really get into you and it can be very relaxing and exciting at the same time. Well done as usual! How fun it must have been to play African drums. I do agree the rhythm is both relaxing and exciting. Thanks for your lovely comment. Carol, what a super creation. Love the tone and detail. A Favorite. I can feel it Carol! This image rocks the house!!! Glad you can feel it, James. Thanks for your fun comment. 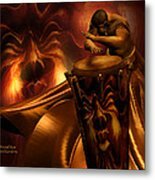 Feel the drum's vibration flowing through your blood with the rhythm of pleasure shaking the ground beneath you sending a primal beat racing hrough your heart and into the night. 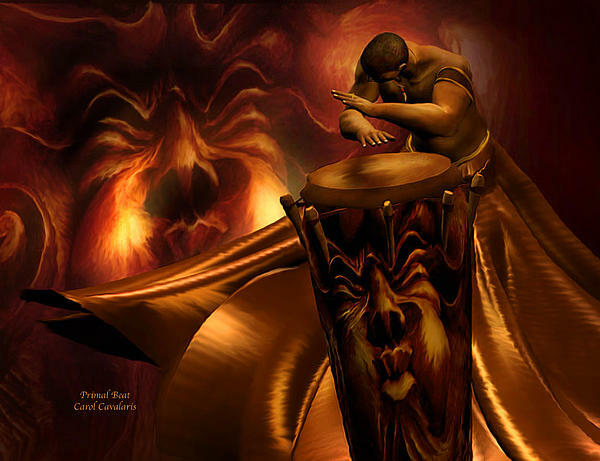 Primal Beat prose by Carol Cavalaris. This tribal art of an African man beating a drum is from the 'Africa' collection of art by Carol Cavalaris. This is a mixed medium work combining digital and painting techniques.